To get an idea of where things currently stand, I pulled 2013 referral data for a selection of 52 magazine and content sites, all well-known brands from major publishers. Organic search had a strong showing at 37.8%, so reports of its decline as a major traffic channel are simply not correct, especially for media sites. The social media figure seemed a little low; I was expecting search to come in around 30% and social to be closer to 15%. Among the 52 sites examined 21 had social figures above 10%, the highest being 28.9%. But there were enough below 10% to pull down the average. It is important to point out that when it comes to setting benchmarks, overall percentages should be no more than a rough guide. A big reason is that the percentage of direct navigation traffic will vary greatly depending on the strength of the brand. 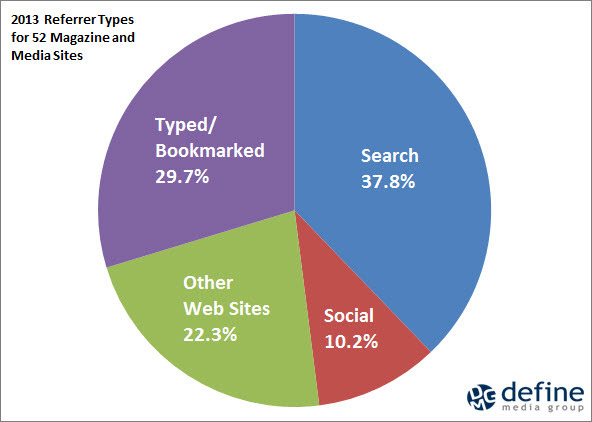 For instance among these 52 sites the typed/bookmarked average was 29.7% but two of the biggest brands came in at 59.5% and 62.6%, bringing their search percentages down to 18.5% and 16.2%, respectively. 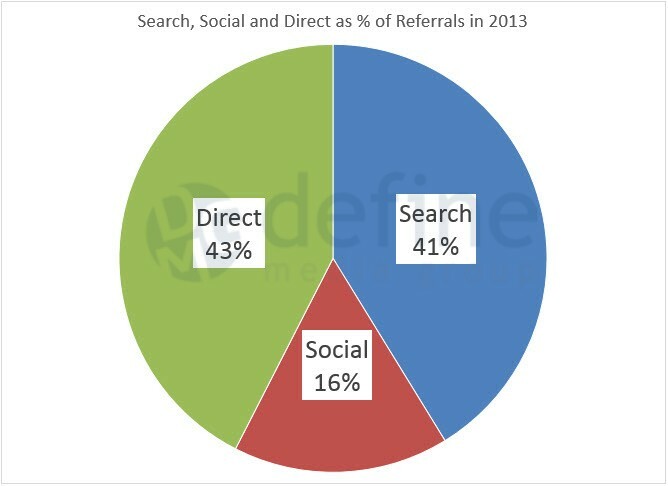 Despite this their total search referrals for the year were still much higher than many of the other sites. So the bottom line is what constitutes good performance is relative, and you need to consider multiple factors including strength of brand, nature of the content, publication frequency, site architecture, level of promotion, etc. After I pulled these figures our team at Define Media Group decided to do a larger-scale analysis. Published last week, it analyzed referral data for 87 sites from a number of major publishers, constituting 10 billion visits for 2013. Hi Adam, thanks for this article. I really thought referrals from social is as high as search nowadays because this is what I’m getting for my sites. Hello Adam! 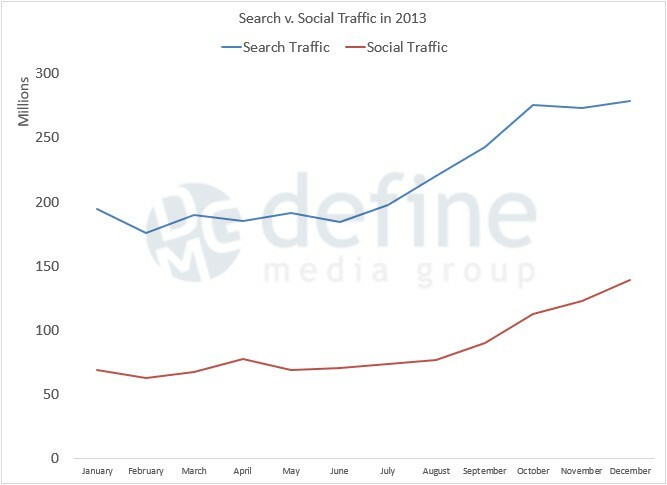 I think you have it right to add the growing traffic coming from Social traffic. I believe that in the coming years, social traffic will eventually surpass search engine traffic unless something new or innovative is introduced by search engines. However the stats you showed are for a specific market. I’m sure that the results shown here are not exactly the same as say for gaming sites. Thanks! This is definitely straightforward and much appreciated for that. This may not be the world’s biggest newsflash but I think the value of social is the word-of-mouth referrals that drive traffic to the search engines. The social media sites have become so ubiquitous a ton of referral stuff is really easily facilitated there. It might be impossible to judge, but I’d be curious what those numbers would look like if word of mouth referrals (or indirect referral from things people have posted) were worked into the numbers. That’s a good point Brodie, it would be interesting to be able to account for word of mouth referrals. Oscar – you are right, this is focused specifically on magazine and news media sites. The figures will vary by industry, audience, subject matter and content type, etc.